These paw print urns are true works-of-art that are hand forged from brass and carved by skilled artisans. This solid brass vase design is created to reach the highest quality standards available in today's pet memorial marketplace. Each urn has hand-carved paw prints and has a threaded screw-on top for easy and safe transferring of your pet’s cremains. 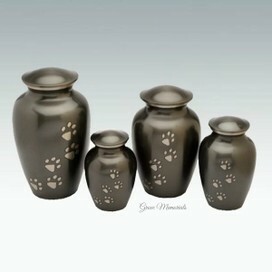 This urn is suitable for a pet that weighed up to 50kgs prior to cremation. This solid brass metal vase style is available in a x-small, small, medium, large and x-large. Dimensions: 15.5cm wide x 15.5cm long x 26cm high.